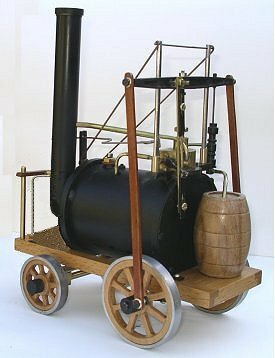 Richard Trevithick's 'Puffing Devil' was the world's first passenger carrying steam road locomotive. It was designed and first tested by Richard Trevithick and friends on Christmas Eve 1801 when they drove the vehicle up Camborne Hill in Cornwall. The success of this first Camborne Hill run led to the testing of the world's first steam railway locomotive at Penydarren in 1804. Trevithick subsequently went on to build the 'Catch-Me-Who-Can' passenger train - the world's first fare-paying passenger railway near Gower St. in London in 1808. It was the first engine to use high pressure steam. James Watt thought that such pressures were dangerous and is said to have remarked that Trevithick deserved hanging for bringing such a thing into the world! There are no known surviving original drawings of the 'Puffing Devil' . This model is loosely based partly on sketches and partly on the Dredging Engine in the Science Museum in Kensington which was manufactured only two years later. Also, in the interests of ease of model construction, changes have been made - so the completed model does not pretend to be an accurate scale model, but it does reflect the essence of the original engine. The kit requires no machining but the boiler does require some soft soldering. The two brass end caps need to be soldered into the brass boiler tube and two M6 nuts need to be soldered onto the boiler body. It should not be too difficult to build by anyone with average tool skills. To build the model, the constructor will also need to screw, glue, saw, drill, file and cut various small mainly brass parts. The tools required are: Torch for soldering the boiler, Small Vice, Small Hacksaw, Screwdriver, Pliers, Wire Cutters, Centre Punch, Hammer, Files, Drill and Drill Bits. Operating Pressure: 5 psi. approx. 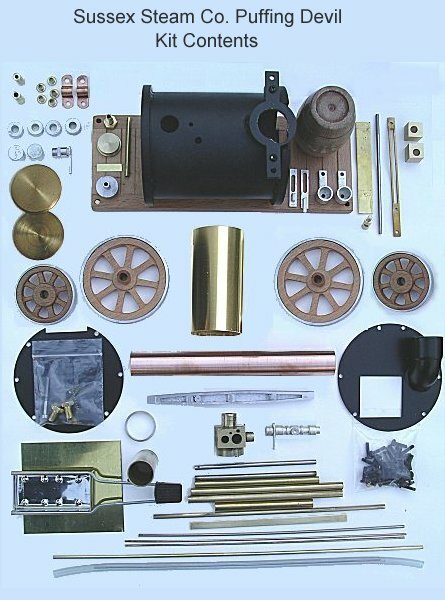 The kit comprises pre-drilled and painted boiler casing, pre-finished wooden chassis and wheels, white metal castings, finished brass components, brass strip, rod and tube, screws, nuts and bolts and fuel tray for stationary operation only (see Notes on Operation). The basic kit comes with a fuel tray to burn solid fuel (Esbit / Mamod Type) tablets. Because of the weight of the engine, the these tablets will provide enough heat and steam pressure to operate the engine in a stationary mode and is sufficient to drive the model along a flat level surface. A Gas Burner kit is available as an optional extra. This burner will produce enough heat and steam pressure to significantly improve the model's performance. The model can also be operated by compressed air. This will be shipped to you separately directly from the Manufacturer. Shipping will be approximately two to four weeks after order. Copyright © Sussex Steam Co. 2011 all rights reserved.